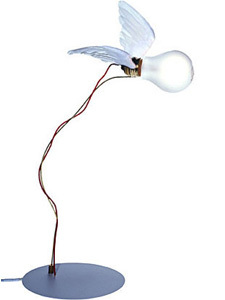 Ingo Maurer Lucellino NT Wall Sconce with feather-winged light bulb. Ingo Maurer's artistic Lucellino NT lights up the night with its soft white feathers. The Lucellino NT Wall Lamp is a member of the iconic Ingo Maurer Birds family. It is one of many pieces from Ingo Maurer that pays homage to - and shows his love of - the classic Edison light bulb. The whimsical Lucellino wall lamp derives its name from the Italian words luce ("light") and uccellino ("little bird") and is available as a wall lamp or table lamp. The Lucellino NT is made of glass, brass, plastic and hand-crafted goose feather wings. The "flight path" of the bird can be adjusted by the user, making each lamp an original piece. Stardust will include 2 complimentary light bulbs with your purchase of the Lucellino NT Wall Lamp. Wall version. Glass, brass, plastic, hand-crafted goosefeather wings. 125/24 volts. 35 watts halogen. Wall clearance approx. 11.81". Table version also available. Wall lamp with a low-voltage lamp and goose-feather wings. Electronic transformer (24V) is included and located in the canopy. 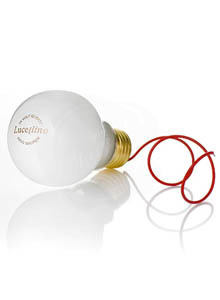 Lucellino is supplied with a 24V low-voltage lamp and also includes a spare lamp. The light bulbs are custom made for Ingo Maurer. Dimensions are approximate as height and width can be adjusted. Lucellino NT has a a 5.9" back plate. Extension from Wall: 7.09"W X 10.23"